One of the projects created by Friends of the High Line in conjunction with Creative Time, A Bell for Every Minute is a sound installation which plays bell sounds familiar in New York City and beyond. Passersby will recognize the rings of the New York Stock Exchange bell, the United Nations’ Peace Bell, bicycle bells, dinner bells, and church bells among others. Bells will ring at specific intervals including a chorus of bells at the top of each buzz. A visual depiction on a physical sound map will identify the location of each bell as the visitor walks through the High Line tunnel between West 13th and West 14th streets. 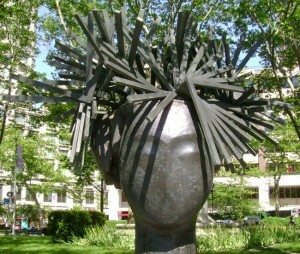 The installation will continue through June 23, 2011. 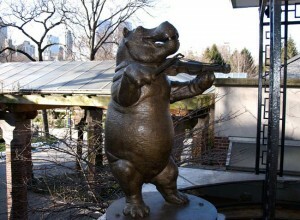 Through January 23, 2011 on Broadway between Columbus Circle and 166th Street in Manhattan, sixteen bronze sculptures are set up including a display with mobile phone access numbers for an audio tour in English or Spanish. Valdes is well-known for his derivative works which play off the works of past masters to create an entirely new aesthetic object. Each sculpture is massive, some over 12 feet in height. My favorite is the massive piece of a man or lady (you decide) in front of the Hotel Empire across from Lincoln Center. 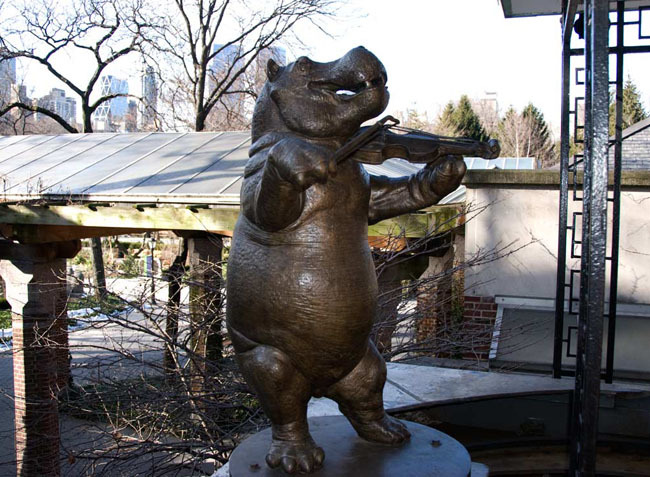 Originally located at the fountain at the world Trade Center’s Tobin Plaza from 1971 to September 11, 2001, this 45,000 pound steel and bronze sculpture has been moved to its permanent home in Battery Park. 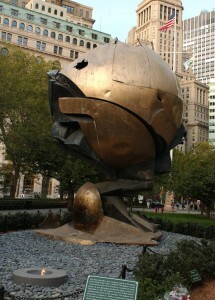 Surrounded at all times by visitors to Ground Zero who pay homage to the many lost and injured by viewing this badly damaged piece of art, the Sphere is a powerful memorial to both the 1993 World Trade Center bombing and 9.11. An eternal flame has been added to this sculpture. Another High Line public art project, the station sits on the High Line between 17th and 18th streets. At the viewing station, visitors look through an opening on top of the viewing post which is lined up with a metal screen from which geometric shapes have been cut. 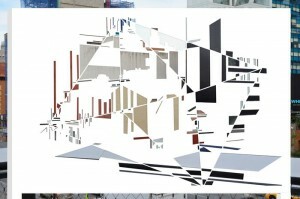 When viewed, the nearby buildings become abstract and distorted, appearing more like photographs or paintings than three-dimensional objects. The station will be in place through May 1, 2011. This entry was posted on Monday, September 27th, 2010 at 1:25 am	and is filed under Stuff to Do. You can follow any responses to this entry through the RSS 2.0 feed. You can leave a response, or trackback from your own site.